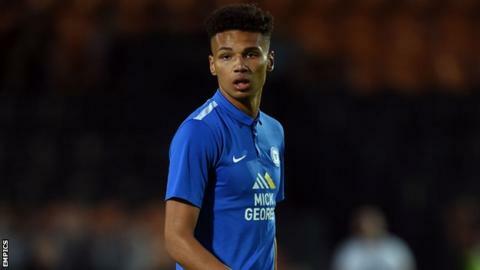 Peterborough's Lee Angol hopes his "bond" with strike partner Souleymane Coulibaly will continue after they both scored twice in the 5-1 win at Oldham. Angol, who was making his Posh debut, and Coulibaly played together in Tottenham's youth system. "I knew Solly before here so we already had that bond and connection," he told BBC Radio Cambridgeshire. "Hopefully we can keep scoring every week, or at least if I'm not scoring, he's scoring or the other way around." Before Saturday's match at Boundary Park Posh had scored only six goals in their previous five games, with only Marcus Maddison having scored more than once this season. Their poor form in front of goal contributed to last week's sacking of Dave Robertson. Caretaker boss Grant McCann said there would be "no hiding places" for Posh players, and Angol said that allowed them to feel freedom to express themselves on the pitch. "When everyone stepped onto the pitch they felt free, because they weren't going to get shouted at for losing the ball," the 21-year-old said. "We were encouraged to keep getting on it and everyone had a free mind. "I don't know why it's come like that, but obviously today was the day and hopefully we can carry it on."